bet365 is back with their most appreciated betting offer! 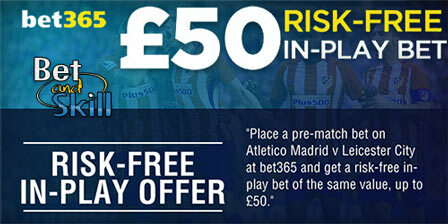 Get a risk-free £50 in-play bet on Atletico Madrid v Leicester, the Champions League quarter-finals first leg match! Don't miss this great opportunity to get a £50 risk-free bet to be staked in-play (during the match). This offer is available to new and existing customers! Bet365 are once again utilising their fantastic In Play offer on Wednesday's Champions League clash between Atletico Madrid and Leicester City with punters given the chance to get a £50 risk-free In Play bet! It's a massive chance for anyone with an account or new customers to get involved in the action with a risk-free bet of up to £50! No matter who – or what – you are backing, you can take advantage of a superb promotion that is only made available for the biggest of games! Place a bet on Atletico Madrid v Leicester before kick-off, then once the game starts at 7.45pm on Wednesday 12th April, place another bet on any In-Play market on the match. If your FIRST In-Play bet is a loser Bet365 will refund this stake, up to the same amount as your largest pre-match bet. There are various ways to take advantage of this offer. You may opt to cover your initial wager with an in-play bet against the original selection (e.g. you could go for Atletico Madrid to win pre-match bet alongside a double chance in-play bet on Leicester or Draw). You could even double up on your original bet if you fancy Atletico Madrid (or another selection) to be the winning choice. This means that you are getting double the odds on Atletico Madrid to win, since you will get your in-play bet refunded should you lose! Stake £50 on "Atletico Madrid to win to nil" pre-match @ 4/5 as qualifying bet. £50 returns £90 cash. Once the game has kicked off, go for a correct score at a bigger price. Eg: Atletico Madrid to be winning 1-0 at HT @ 3/1. £50 returns £150 cash. This offer applies to bets placed on the Atletico Madrid v Leicester Champions League match, played on Wednesday 12th April 2017. Risk free bet value will be equal to the stake of your largest pre-match single bet placed on the Atletico Madrid v Leicester Champions League match, played on Wednesday 12th April 2017, up to a maximum of £50*. Pre-match bets that are fully or partly Cashed Out, or edited using our Edit Bet feature, will not qualify for the offer whether Cashed Out or edited pre-match or In-Play. The largest pre-match bet that has not been fully or partly Cashed Out, or edited using our Edit Bet feature, will qualify (up to £50*). Risk free bet will be deemed your first single bet placed In-Play on the Atletico Madrid v Leicester Champions League match, played on Wednesday 12th April 2017. If your first single In-Play bet is fully or partly Cashed Out, or edited using our Edit Bet feature, you will no longer be eligible to receive this offer. Note that 'pre-match' is defined as bets placed prior to kick-off of the Atletico Madrid v Leicester Champions League match, played on Wednesday 12th April 2017 and 'In-Play' is defined as any bet struck after the game has kicked off. "Bet365 £50 free in-play bet on Atletico Madrid v Leicester. Risk-free!"